For the first time ever at climate change negotiations, representatives of Russia's indigenous peoples organised an entirely separate pavilion in the 'Climate Generation' zone, located in the immediate vicinity of Le Bourget, the venue of the recent negotiations in Paris. Residents of the Altai, Chukotka and Kamchatka regions—as well as representatives from a whole host of regions and republics of the Russian Federation—presented photo exhibitions and films. They held tasting sessions of the cuisines of indigenous people of Russia's Far North and Far East (largely fish, porridge from buckwheat or oatmeal, as well as berry juice and other delicacies). Folk songs were sung and circle dances were held, as well as demonstrations of how to make household items—such as combs—from fish bones. Bur representatives of indigenous communities did not come to Paris just to bring their food and folk songs: they also had stories to tell. Their stories were about how climate change is affecting traditional ways of life for indigenous peoples across Russia and threatening communities. Their stories also told of the rising conflicts between indigenous peoples and mining companies— conflicts which are rarely resolved in favour of the former. Several activists campaigning to defend the rights of indigenous communities against companies' plans to mine for minerals in native lands have even been threatened with prosecution. 'The biggest challenge for us is the instability and unpredictability of weather' says Vyacheslav Shadrin, head of the council of elders of the Yukaghir people in Russia's Republic of Yakutia. Overall, some 30,000 indigenous people live in the region—across Russia there are nearly 240,000 indigenous people, representing some 41 groups. Representatives of indigenous communities did not come to Paris just to bring their food and folk songs: they also had stories to tell. In Shadrin's words, inhabitants of the region have over many years witnessed a decline in snow, an increase in flooding and the destruction of the shores of northern lakes and rivers, as well as a shift of forested regions towards the north, which brings with it new species of animal and plant life. All of these processes represent a direct threat to the traditional way of life of indigenous peoples. One of the greatest challenges face by Russia's indigenous peoples today is the instability and unpredictability of weather. (c) Sitdikov/RIAAlready, residents of the region have to contend with the devastating consequences of climate change on their traditional occupation—reindeer herding. The appearance of new forested areas reduces the size of reindeer pastures, changing migration routes for wild reindeer, which are then often taken away to be domesticated. 'Many settlements which depend on hunting and fishing for their survival are now less able to produce their own food' says Shadrin. 'Many people then go in search of prey on the thin ice of lakes and rivers, putting their lives at serious risk'. Increasingly, the regions of the Far North see atypical rainfall patterns—for example winter rains, which lead to a crust of ice on top of the snow, which makes it much more difficult reindeer to find food. Recent research by Norwegian and Russian scientists concluded that the warmer climate in the Yamal Peninsula could even lead to the complete disappearance of reindeer in the area. In other regions of the Far North (such as Yakutia), snow cover has become even deeper, which also makes it noticeably more difficult for reindeer to feed themselves. Significant climate change could also lead to the erosion of old cemeteries where people who died from plague or smallpox were buried, claims Shadrin. Ancient animals who died many years ago of the 'Siberian plague'—otherwise known as anthrax—may also begin to thaw as a result of climate change. 'The industrial development of territories inhabited by indigenous peoples already poses a greater threat than climate change' claims Dmitry Berezhkov, one of the co-ordinators of the pavilion for Russia's indigenous people at the UN's climate conference, and an employee of the Association of Indigenous Nations of the North. Berezhkov received political asylum in Norway several years ago. He says that as a result of his work defending the rights of indigenous groups—first in Kamchatka, and then in Moscow—he was illegally accused of stealing money from the Russian state budget, and consequently had to flee the country. Rodion Sulyandziga, leader of Russia's co-ordination centre for indigenous and small nations of the North (an organisation recently declared to be a 'foreign agent') also believes that the conflicts between indigenous peoples and mining companies have multiplied in recent years. 'We understand that to a large degree, resource extraction is the basis of the Russian economy', says Sulyandziga, 'but it seems necessary to us to regulate this relationship'. According to the expert, mining companies often receive a license for extraction, after which they even seek ecological advice. But they very rarely hold real consultations with the indigenous communities inhabiting the region. 'Even when they do occur, they have a rather declarative character'—says Rodion. In 2001, the Russian Federation passed a law on the 'traditional use of territories of the indigenous peoples of the North, Siberia and Far East of the Russian Federation'. However, no actual attempts at implementing the act or allocating the aforementioned territories have since appeared. Dmitry Berezhkov says that business has been in conflict with representatives of indigenous peoples since the 1990s, however the resistance substantially increased in 2008 when new amendments to the law on fishing and hunting allowed companies to take—and lease—lands inhabited by indigenous peoples. 'Over the last two years we have noticed a significant growth of such conflicts,' he continues. 'If pressure on activists used to be enacted through the media or administrative resources, suppression of activists with the aid of law enforcement has now started, which brings criminal charges'. Business has been in conflict with representatives of indigenous peoples since the 1990s. Rodion Sulyandziga cites the examples of three major recent conflicts. In the Khanty-Mansi Autonomous Okrug region, legal proceedings have continued for several months against Khanty Shaman Sergey Kechimov. 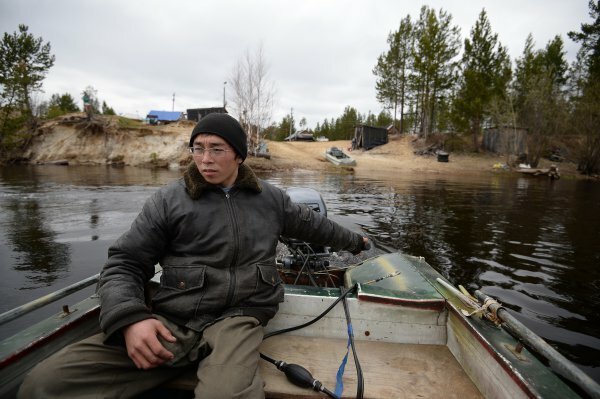 Kechimov is accused of making death threats in an effort to defend the Imlor Lake—which is considered sacred by the Khanty people—from the plans of oil prospectors. A few years ago, the Surgutneftegaz company received permission from the state to start oil production on Kechimov's tribal lands, near the Imlor lake. Representatives of the company agreed with all indigenous residents of the settlement—except Kechimov, who 'on the basis of his own convictions and beliefs, unequivocally voiced his protest against carrying out any such work on lands sacred to the Khanty and Mansi peoples'. During one of these arguments, Kechimov shot the dog of one of the company employees with his rifle after—according to Kechimov—it had bitten one of his reindeer. 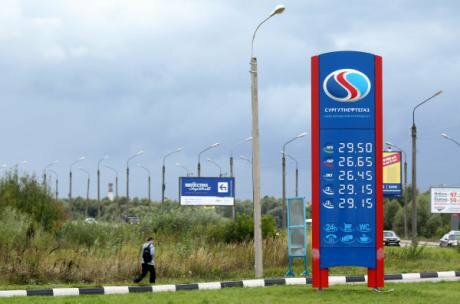 A few years ago, the Surgutneftegaz company received permission from the state to start oil production on Kechimov's tribal lands. (c) Konstanin Chalabov/RIAOther employees of Surgutneftegaz also say that Kechimov has threatened them with a rifle. As a result, a legal case was instituted against him after some time, on the basis of his 'death threats'. In such trials, representatives of indigenous peoples are actively supported by Russian ecologists, including members of Greenpeace. 'One of the greatest curses of indigenous peoples is oil and the filthy network of pipes and plants which expand endlessly without giving a thought to the fact that people live here. In the best cases, companies give a small 'payment' for having destroyed the earth, although usually they give nothing. It could be even worse. Two years ago we paid a visit to Sergey Kechimov, the Khanty reindeer herder from the Imlor Lake, sacred to his people. He invited us so as to show us how oil companies are destroying his land. He complained at every opportunity about oil spills on the lake and about poachers. But he never got justice. Today, Sergey is being threatened with a prison sentence; Surgutneftegaz—which has found millions of tonnes of oil beneath his lake—is accusing a reindeer herder of having threatened oilmen', write ecologists. A second story is unfolding in the Far East in the Amur Region, where the council head of a local Evenk settlement Sergey Nikiforov was sentenced to five years in a penal colony and handed a fine of 16 m roubles for taking bribes and abuse of office. Local residents and ecological activists believe that the case against Nikiforov—who actively fought against gold miners' designs on the territory of the indigenous community—is fabricated. Villagers regularly hold protests and write to the prosecutor's office and Russian supreme court to demand a review of the sentence. The third story is set in the Kuzentsk coal basin in Kemerovo Region, one of Russia's traditional coal-mining areas. There is talk of a conflict between coal mining companies and the Shors, the indigenous people of the Kuzbas (as the region is also known). A number of local activists raised the problem at the UN's climate conference in Paris, as part of an event arranged by the ecological organisation Ekozashchita! which has also been declared a 'foreign agent'. The violation of the rights of indigenous people in the Kuzbas was included in The Cost of Coal, a report presented at the conference analysing the ecological and social consequences of the coal industry. 'For the Shors—the indigenous people of the Kuzbas—coal mining means the loss of ancestral lands, traditional crafts and ways of life. The development of open-pit mines along coal seams—the method used to extract 70-80 per cent of the Kuzbas's coal—creates a lunar landscape, leads to the death of forests and the disappearance of fur-bearing animals. Shor settlements come next,' notes the report. In the words of Aleksandr Arbachakov—a Shor community representative—the development of the coal industry led to the disappearance of the village of Kazas, where the majority of the residents were forced to sell their houses and leave. The houses of the few activists who chose to remain were set ablaze. 'By defence of the rights of the indigenous population, local authorities understand the development of traditional culture—dances, songs and museums—but go deaf when it comes to land rights' declared Arbachakov at the event in Paris. Residents of the region also turned to Vladimir Putin with a request to defend them and 'end the ecological crimes committed by the Yuzhnaya, OAO Holding and Sibuglemet companies, which has entailed the genocide of both the Russian and Shor peoples'. 'In fact, alongside climate change, another major problem for the indigenous peoples of Russia is access to these minerals. Although they bring a huge income to the country's economy, for us—the indigenous inhabitants of the regions where oil, gas and metals are extracted—they are often a curse' declared Vyacheslav Shadrin in Paris. In his words, 80 per cent of the drinkable water, 90 per cent of the forests, 100 per cent of the diamonds and 90 per cent of Russia's oil, gas and gold reserves are located in territories belonging to indigenous peoples. Nevertheless, extracting such resources frequently brings only ecological and social problems for the regions' inhabitants. '60 per cent of the land on the island of Sakhalin has been degraded, while 90 per cent of the reindeer pastures are no longer fit for use', he says. In his own region of Yakutia, fifteen major industrial projects already exist on indigenous peoples' territories. 'High environmental and social risks remain for the majority of large industrial projects being developed in the Far North, Siberia and Far East, whether in the development of new oil and gas pipelines or in plans to develop floating nuclear power plants and hydroelectric power stations. For indigenous peoples across Russia's regions, land seizures remain a real and pressing problem' concludes Shadrin. Having brought their stories in person to Paris last week, it remains to be seen whether the climate concerns of Russia's indigenous peoples will finally be listened to.